It’s wonderful to hear from you Clive. I trust you are still entertaining the masses with your masterful command of the blues. Your question is most welcome and I hope you won’t mind me publishing my analysis, both for your benefit and for the benefit of our reader. You may have seen my review of Hohner’s Blues Bender harmonica, where the topic of reed plate thickness was hauled under the microscope. Blues Bender plates are 1.20mm thick which, from subsequent conversations with Hohner, will offer a player some clear advantages. My only real beef was the packaging statement which says the thicker reed plate gives consistent tone. What, I wonder, would inconsistent tone be? So, your question about Hohner’s MS replacement reed plates provides a welcome extension to this theme. For more information on Hohner’s MS plates, I contacted Hohner UK and I also emailed Steve Baker in Germany. Why would Hohner HQ offer one reed plate specification to the Worldwide Market and another to the US market? They don’t, that’s a marketing decision made by Hohner USA. Hohner in Germany doesn’t have anything to do with it. The MS series is manufactured using 0.9mm plates on Big River, Blues Harp & Pro Harp, and 1.05mm plates on Cross Harp & Meisterklasse. All these models are sold like that in the USA too. Hohner USA decided to only stock the thicker replacement plates for logistical reasons, as they work fine on all models. What are the benefits of a thicker plate in terms of tone and volume (accepting that these are two different things)? Are the benefits theoretical or is there and scientific evidence? In my experience, thicker reed plates definitely make the harp louder and brighter (stronger overtone partials), which may be desirable or not depending on your preferences. Various manufacturers use this as a method of making their instruments louder out of the box. Personally I don’t find it to be an advantage and prefer 0.9mm reed plates. Hohner UK point out that thicker reed plates give reeds ‘a deeper swing, thereby providing more power. The reeds travel further as more air is pushed across them’. How does this improve performance, tone and volume? Are there any consequent disadvantages? This appears to be true, see above. However, I don’t necessarily regard it as an improvement. 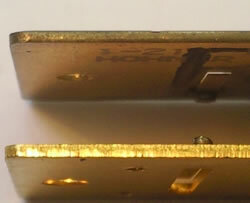 Due to the greater amplitude, thicker reed plates can lead to greater reed stress and earlier breakage, so any advantages in terms of volume and “power” will be a trade off. Are there any variables inherent in the different keys? Is there an optimum key in relation to reed plate thickness and overall performance? It would seem to me that thicker plates make more sense in lower keys. Unfortunately it’s very difficult to make reed plates of varying thickness from the low end to the high end and Hohner’s 2 different guages are simply an attempt to find a workable way of offering viable alternatives. Both thicknesses work fine in all keys though. I imagine any performance improvements relative to plate width, regardless of harp key, are minuscule as we are dealing with a 0.1mm degree of difference. The differences are quite noticeable to me and I assume also to many other players. Why would Hohner not advertise replacement plates as openly as, say, Lee Oskar? Is it simply because they wish to promote sales of their fully assembled units? The service department at Hohner in Germany sells spare reed plates and all other parts directly to the consumer (also internationally). Lee only has one instrument so his situation is logistically much simpler. 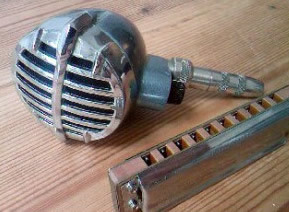 Few retailers know much about the harmonica and it’s understandably difficult to persuade them to stock spare parts which they may never sell. Many long-term players buy them online for that reason. As with cars, spare parts are proportionally more expensive and therefore more profitable, so Hohner in Germany has nothing whatsoever against selling as many as possible. I can’t answer for the policies adopted by subsidiaries in other countries. you wear out harps quickly, you might wear out harps with slightly thicker reedplates slightly thicker. Aside from that, the only thing I really mention is that the MS Blues Harps don’t really have a lot to do with the old Blues harps, in much the same way that the MS Marine Band (may it rest in peace) didn’t have much in common with the classic version. On the Harp-L forum, Joe Broecker explains the current code stamp on the Hohner MS series diatonic harmonica reed plates. This was printed on a blow reed plate: 1-216-1011018/1 G Dur Hohner 27/03 L9/KA2. The code may also be printed on other Hohners, I don’t know. It could be an important indicator of the harp’s vintage. As you mentioned the Hohner Blues Harp, I thought you might find the following interesting. It’s about the reeds themselves rather than the reed plates, but it’s useful. Apparently there has been a common myth surrounding the Hohner Blues Harp that its reeds are thinner than those on other Hohner models and that they are ‘pre-stressed’. This common assumption has led to the belief that they therefore provide a weaker tone and have a shorter reed life span. Pat Missin dispels this myth on his excellent website here. My thanks to Clive Langhorn for posing the question, and Steve Proctor, Steve Baker and Pat Missin for helping to provide the answers. I hope you find this helpful. If you’re in the US, then perhaps contact Hohner USA. Otherwise I am pretty certain there are specialists out there who make their own combs for purchase. I could always ask my dear friends Joe Felisko and Pat Missin too – they’re sure to know. 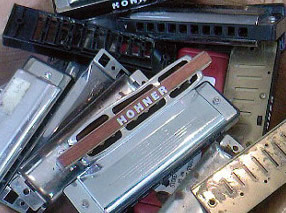 Don the comb, covers and reed plates are all standard replacement parts for Hohner. Harmonicas Direct should be able to get them, Peter has always been very helpful and saves searching abroad for stuff. Hi..my name is Haz7maX..I’ve been playing harmonica since 1982..I customize all my harmonica but I noticed a few things about comb size make a difference..why don’t they just ever sell one harmonica that is basicly a diatonic just a 4/3 bigger?? Do you know what I mean?? You must be a friend of C3PO if that’s really your name. Our first harmonica playing Droid. It had to happen eventually. I have to be honest Haz7maX and say, no I don’t know what you mean. In a very friendly way of course! Could you explain what it is you need, and why you need it, a bit more? I have a number of new Hohner MS blues harps all of which are fine except for the Key of A on which the third hole blow and to a lesser extent the 3 hole draw are both very “leaky”. You say the others are all fine and they are the same brand of Hohner MS Blues Harp. You’ve also tried adjusting the 3 hole reeds and still no improvement. On this bassis, I suspect it may be a manufacturing problem. Also no mention of the 2 draw which is usually an area of frustration. You know what you’re doing. Either contact Hohner and ask about their returns policy, or keep what you’ve got and try swapping the reed plates, if you have another MS harp in A, to see if there’s any improvement. Thanks – I was beginning to think it was my playing but a friend has lent me a replacement Hohner MS Blues Harp in A and it works fine. Incidentally I think the Harpsurgery site is first class, as a beginner I’m working my way through the Harp skills section – very useful. I may then try the Skype lessons. 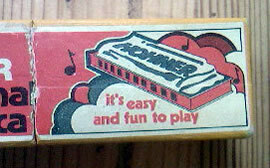 So I will take your advice and contact Hohner. If one reed brakes , is there a place you can buy the single reed or I have to replace the wole plate. It is possible to buy single reeds, but you’ll need the tools to remove the old reed and screw in the new one. Hohner do reed repair kits and I believe Seydel offer something similar. No doubt you’ll also find YouTube videos on how to engineer reed replacements.